When it comes to oils that can easily be used to help improve and replenish your skin and hair, there are many to choose from. Make sure you put this one somewhere on your list. Though it’s not as well known as some of the other options, it really works wonders. Derived from the fruit that comes from the manketti tree, the nut’s oil has been used for years in various parts of the world for skin and hair care. Moisturizing- Due to the high content of polyunsaturated fatty acids it is actually better than saturated fatty acids that can be found in coconut oil because they remain on the skin for a longer period of time. If you are really struggling with dry, cracked skin or skin that’s started to look drab and lifeless, this is an oil that you should moisturize with. Anti-Aging- Mongongo oil can help remove and prevent wrinkles and fine lines as it helps the skin retain needed moisture which improves the texture, making you wrinkle and fine line free. Damaged Hair and Dry Scalp- This oil is very helpful to those who experience dry and damaged hair, but even more than that, it can be used to help treat the scalp for dry, itchy or scaly scalp. Try incorporating a couple of drops into your shampoo and notice how the health of your scalp improves significantly after using it for about a week or two. 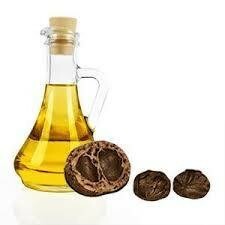 Your hair will also be easier to manage and maintain after using this oil for a bit of time. Mongongo oil is a great addition to cosmetic applications, personal care formulations, soaps, lotions, hair serums, scrubs and so much more.